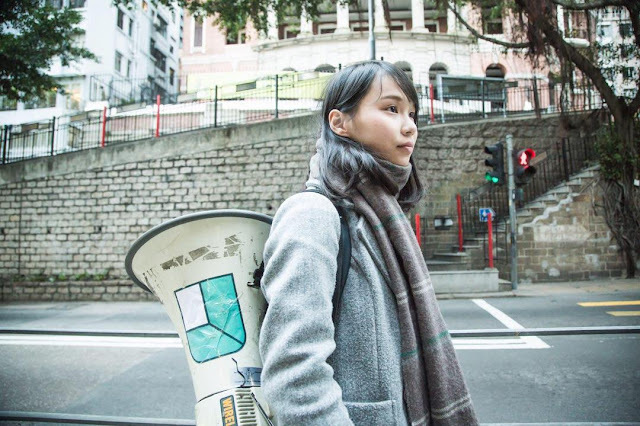 Barely old enough to run, 21-year-old Agnes Chow (周庭) of pro-democracy party Demosisto has thrown her hat into the ring hoping to win back Law’s Hong Kong Island seat. Her decision to run has not come without a price: she has deferred her final year at Baptist University, where she studies government and international relations, and renounced her British citizenship, a requirement under the Basic Law. I sat down with Chow at a café in Causeway Bay earlier this week, after her campaign trail had taken her to busy Great George Street that evening. Over recent weeks, Chow, accompanied by her Demosisto posse, has been giving soapbox speeches and handing out flyers up and down Hong Kong Island’s north coast from Kennedy Town to Chai Wan. Their first shift begins at 7:15 am, early enough to catch the morning commuters, and the last one ends after sundown at 8:00 pm. Chow walked into the coffee shop and waved hello to me before slumping into a chair. She was visibly exhausted and a bit tense. JN: Let’s start with the most obvious question: are you running as Nathan Law’s substitute or as Agnes Chow? AC: I’m running for all of the pro-democracy camp. Six lawmakers have lost their seats because Beijing cheated the system [through the Basic Law reinterpretation] and overrode the wishes of hundreds of thousands of Hong Kong people who had voted for them. My campaign is about more than one seat; it’s about the balance of power between the pro-Beijing establishment and the entire opposition. That said, I’m my own person and I stand on my own feet. 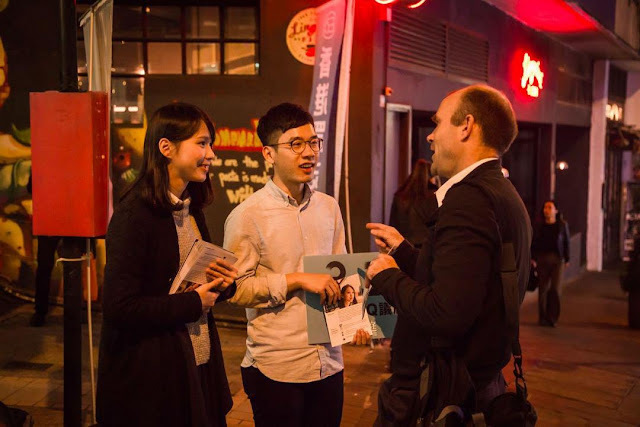 While Nathan and I come from the same political party and we want the same things for Hong Kong, there are certain policy issues I’m particularly interested in and concerned about, and vice versa for Nathan. JN: For those who don’t know you, who is Agnes Chow and what does she stand for? AC: I want voters to see me as someone who’s been deeply involved in the pro-democracy movement in Hong Kong for the past six years. 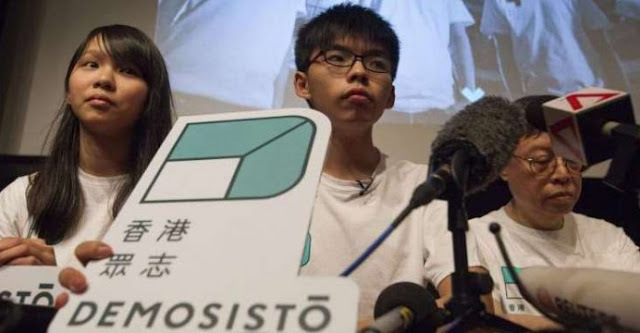 I started as a core member in Scholarism [Demosisto’s predecessor], went through the national education protests and the Occupy Movement, co-founded Demosisto and, during Nathan’s term in office, spent most of my time doing policy research on issues such as rural development and public infrastructure projects. My campaign has two main focuses: education and land-use planning. Students in Hong Kong are over-stressed and suicide cases have surged in recent years. I support putting at least one counsellor in every school and making contract teachers permanent hires. These programs cost money and so it’s critical that we allocate our education budget wisely, instead of spending it on things like patriotic curriculums and paid school trips to mainland China. As for land-use planning, the Hong Kong government is known for its “white elephant” development projects that almost always overrun their budget. Look at the East Lantau Metropolis proposal for instance: the government wants to reclaim massive land and build a bridge connecting the proposed metropolis to Kennedy Town. The whole concept is based on bad assumptions of population growth and stands to benefit powerful property developers. 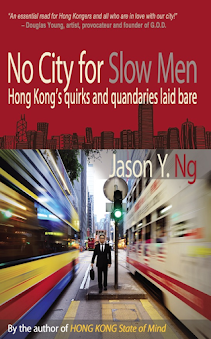 Government plans like that require proper vetting and a much closer review by LegCo. JN: Considering that the voting rules in LegCo are stacked against the opposition, what is it that you hope to achieve as an opposition lawmaker? What will do you do differently that your predecessors haven’t already tried? 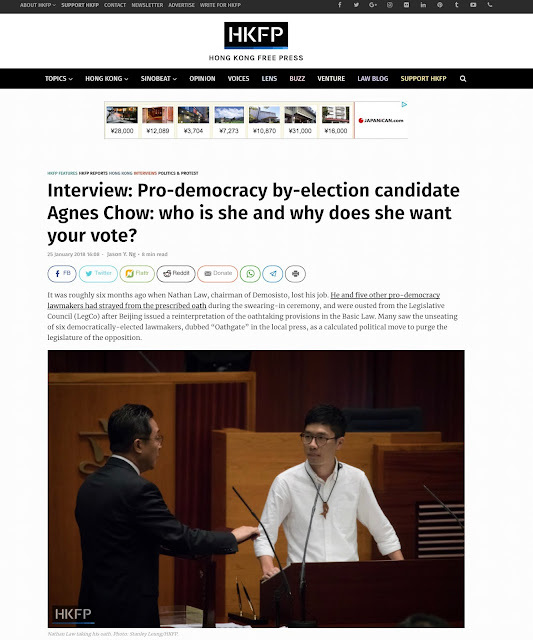 AC: You’re right about the voting rules in LegCo, but I believe being a lawmaker is much more than simply pushing a button and voting “yes” or “no” on government bills. LegCo is a platform for the opposition to challenge government officials on their policies and spending requests. By asking relevant, well-informed questions, lawmakers not only can hold the government’s feet to the fire, but they can also raise public awareness on important policy issues. Before Nathan and Edward Yiu (姚松炎) [of the Architectural, Surveying, Planning and Landscape sector] were disqualified, they, together with like-minded LegCo members like Eddie Chu (朱凱廸) and Ray Chan (陳志全) succeeded in doing just that. Their efforts were stalled after the oath-taking drama and I intend to pick up the mantle if I win back the Hong Kong Island seat. And that answers the second part of your question: I don’t think I need to be overly creative to come up with new, over-the-top tactics on the Legco floor to draw attention to myself or to the issues I care about. Challenging the government with pointed, educated questions is the best way to hold it accountable. JN: If you win, you would be the youngest person ever to be elected to the legislature. Do you think your age has made it difficult for voters to take you seriously? Carrie Lam once called you a “little girl”, and what have you done to shake that image? AC: As I mentioned earlier, I’ve been an activist for six years; I didn’t come out of nowhere. The Carrie Lam incident tells us the kind of leader she is—she is no different from her predecessors. She says she cares about youth issues, but her action indicates otherwise. Our chief executive needs to start taking young people more seriously. JN: Are you worried about being disqualified from the election, the same way several pro-independence candidates were in 2016? 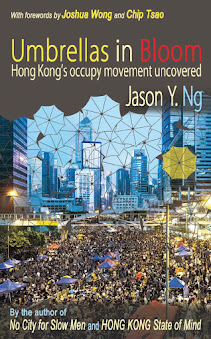 AC: I’ve already signed the required declaration [to uphold the Basic Law and pledge allegiance to Hong Kong]. I don’t think the returning officer [who approves nominations] has any grounds to bar me from running. Demosisto advocates self-determination, which is about civil liberties, universal suffrage, and the ability to make life choices and not follow rules made by big businesses working in cahoots with the government. It’s completely different from advocating independence. JN: You abruptly stepped down as the spokesperson for Scholarism during the Occupy Movement due to, in your own words, “heavy pressure” and “extreme fatigue.” This time around, will you be able to handle the pressure of running a major election campaign or will you quit once the proverbial kitchen gets too hot? AC: During Occupy, my parents heard rumors that Beijing would order a military clearance and they flipped out. They almost put me on a plane out of fear for my safety. I was 17 back then and I had to do something to make them stop worrying about me. Even after I resigned as spokesperson, I continued to be involved in the movement behind the scenes. Four years is a long time and things between me and my parents are very different now. We’ve talked things through and they are very supportive of my decision to run for office. I’m also older now and can make informed choices for myself. JN: On the subject of pressure, what do you do to destress? AC: I swim, but going to the pool takes too much time—time that I don’t have these days. And so I do all sort of household chores, which I find therapeutic. I also watch Japanese variety shows and listen to Japanese pop music. With that, Chow finally cracked a smile. She had taught herself Japanese by watching television programs and she can now even do entire interviews in Japanese. It is one of the many things that makes her interesting and different. As I closed my notebook and started to chat off the record about her temporary rental apartment on Hong Kong Island, she became more relaxed. Agnes is a politician-in-training, and in-waiting, as the returning officer is expected to make a decision on the validity of her nomination in the coming days. Other Legco candidates in the Hong Kong Island geographical constituency include Judy Chan Kar-pui and Edward Yam Liang-hsien. This interview was published in Hong Kong Free Press under the title "Pro-democracy by-election candidate Agnes Chow: who is she and why does she want your vote?"